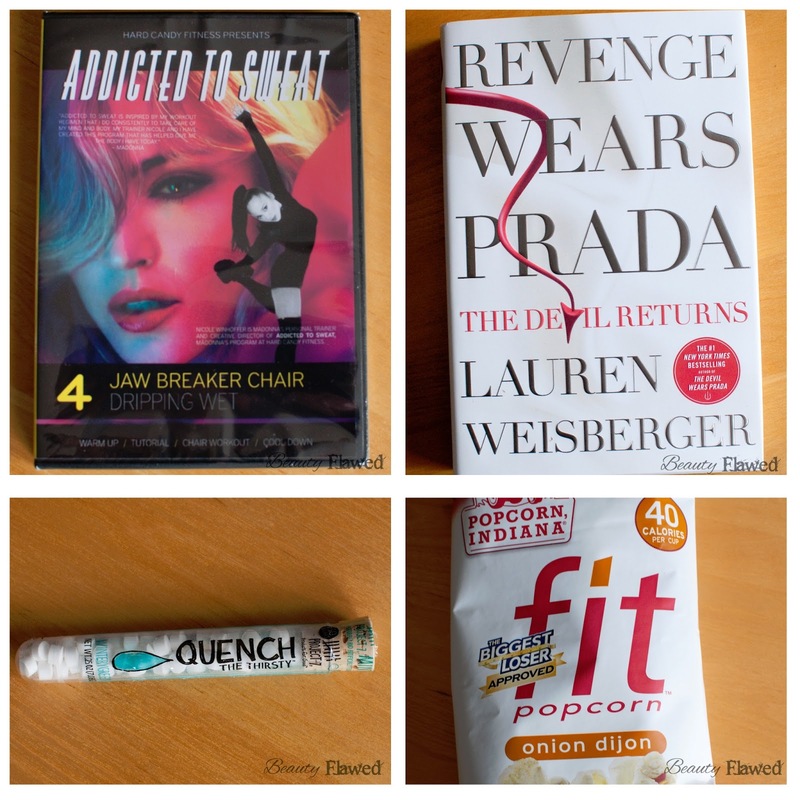 My POPSUGAR Must Have box for June arrived today! Shipping this month was pretty quick for me especially since I just posted spoilers yesterday. While not everything in this box is for me I still think this is an overall good box. My favorite items in this box would have to be the scarf and the mints because they are tasty. This scarf’s msrp value alone covers the whole box so what’s not to love. I really like the color combination and in person the pink/coral section is not quite as neon as it is in the pictures. The colors complement each other really well without being too out there. Sadly my scarf has a small run in it, I hope I can fix it so it doesn’t snag anymore (you can see a close up of this in the YouTube video I made). 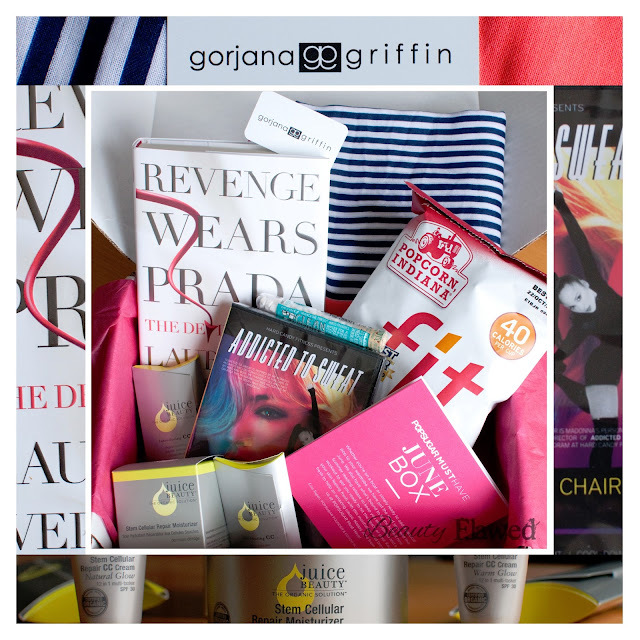 Also included is a unique coupon code to the Gorjana & Griffon website for $25.00 off your order. Another product that even alone covers the entire cost of the box, we are off to a good start. I don’t know that this is really a product for me because it is targeted for anti-ageing and I don’t have that many wrinkles at 24. I have tried anti-aging stuff in the past and it made me break out so I think this might be going to my mom if she’s interested in it. Check out the top on this thing am I the only one who thinks it’s a bit odd? The CC cream samples are a nice addition I think and they included both shades from the line. I like doing workout DVD’s every now and then so I will give this a go however I’m not overly thrilled by it. I never read the first book but I have seen the movie and really enjoyed it. While I do prefer my kindle to hardcover book I will give this a read anyway, here’s hoping it’s good. I actually really like this company because they help provide clean water to communities around the world. I usually buy the Vanilla mint gum they sell but I think I’ll start buying these mints too as they are quite tasty. This popcorn is biggest loser approved and it has a light and airy texture. I don’t find it incredibly flavorful but it does smell great. Not bad for a popcorn but I don’t’ think I would pay full retail for this. Based on MSRP values and estimates this box comes to $168.88 not including samples or coupon codes. Again I think they did a good job on this box even if all the items weren’t for me the value is there and you really are getting your money’s worth. This is my last referral box and I plan on continuing with my subscription. Thank you to all who have become POPSUGAR subscribers with my referral link. Is the coupon code good on sale items? I've browsed the site quite a bit, but the only thing I really want is a necklace that is on sale. "Valid for one (1) use only. Not applicable towards tax or shipping costs. Cannot be combined with any other offers, promotions, or use on sale items. GCodes cannot be replaced or redeemed for cash." I hope someday I can budget that into my monthly expenses. It has become my fave subscription box even though it is more on the expensive side I think this is the one I would keep above all others. I have read a couple of posts about POPSUGAR Must Have from you and while a few of the items included every week I could take or leave, I am really super impressed by the fact that they frequently include books and that is awesome!